Back in 2011, our Wild Man Beard Oil Conditioner became an instant best-seller and set a standard for natural beard care. Our Beard Conditioner is so versatile, absorbent and lightweight, it can be enjoyed by any and all skin types. But, we felt our line needed a new product for those beards requiring some extra TLC. By the end of 2012, we had developed another best-seller: Wild Man Beard Cream.With Father's Day just a few weeks away, we're taking a closer look at this ever-popular man gift. Our formula starts with Organic Coconut Oil, a deeply moisturizing, though highly absorbent ingredient that offers long-lasting softening power and a non-greasy feel. We add just enough Pacific Northwest Beeswax to stiffen our cream for a soft hold that allows for light styling and shaping of unruly beards. The formula is boosted with hair-strengthening botanicals and our signature essential oil blends. Initially offered exclusively in The Original scent, Beard Cream is now available in our four traditional scents plus an unscented version. Using Wild Man Beard Cream is simple: Rub a pea-sized amount between the palms to melt, then massage into a dry beard down to the roots. Applying to a dry beard maximizes absorption and softening power of this leave-in conditioning cream. Increase the amount used depending on beard length and skin type. Wild Man Beard Cream can be used as a nighttime beard treatment or in conjunction with Wild Man Beard Conditioner. For best results, wash and thoroughly dry the beard using Wild Man Beard Wash as needed, several times a week. 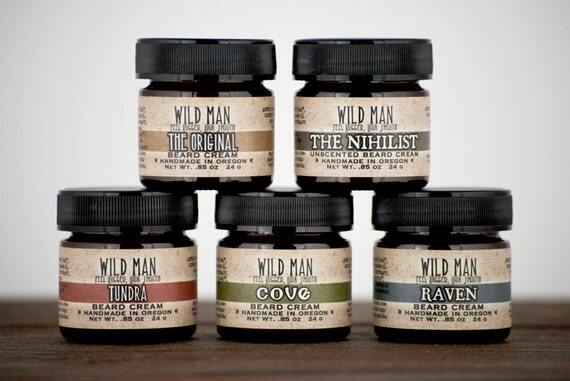 Wild Man Beard Cream has become a favorite among those seeking a natural, yet powerful beard softening product. Used alone or with the rest of the Wild Man line, you're sure to enjoy a softer, more controlled and less irritating beard. Know a Wild Man with an untamed beard? Are you one yourself? Try Wild Man Beard Cream and see the difference!